Fig. 3-7. Keplerian Orbital Elements. "TP marks the direction of the Vernal Equinox. Q is measured in the plane of the Earth's equator, and a is measured in the orbit plane. The intersection of the orbit plane and the reference plane through the center of mass is the line of nodes. 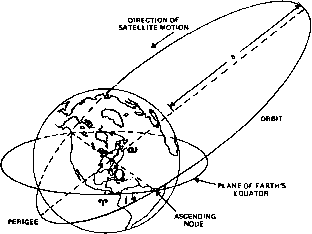 For an Earth satellite, the ascending node is the point in its orbit where a satellite crosses the equatorial plane going from south to north. The descending node is the point where it crosses the equatorial plane from north to south. Thus, in. Fig. 3-5, if the plane of the paper is the reference plane and the dashed part of the orbit is below the paper, then the nodes are as illustrated. 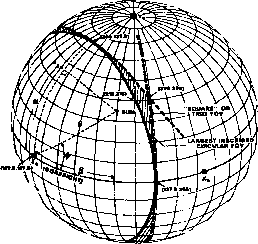 To define fully the orbital plane of a satellite we need to specify both its inclination and its eastwest orientation. The latter is defined by the right ascension of the ascending node, Q, or the angle in the equatorial plane measured eastward from the vernal equinox to the ascending node of the orbit. (The vernal equinox is the ascending node of the Earth's orbit about the Sun.) The rotation of the orbit within the orbital plane is defined by the argument of perigee, u, or the angle at the barycenter measured in the orbital plane in the direction of the satellite's motion from the ascending node to perigee. Finally, we need some method to specify where a satellite is in its orbit. The true anomaly, v, is the angle measured at the barycenter between the perigee point and the satellite. The mean anomaly, M, is 360 • (A//P) deg, where P is the orbital period and At is the time since perigee passage of the satellite; thus, M = v for a satellite in a circular orbit. The mean anomaly at any time is a trivial calculation and of no physical interest. The quantity of real interest is the true anomaly, which is difficult to calculate. The eccentric anomaly, E, is introduced as an intermediate variable relating the other two. 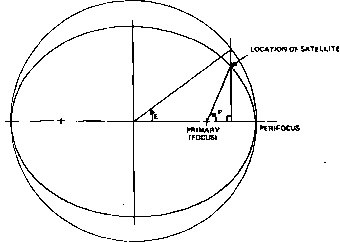 E is the angle measured at the center of the orbit between perigee and the projection (as shown in Fig. 3-8) of the satellite onto a circular orbit with the same semimajor axis. Fig. 3-8. Definition of True Anomaly, p, and Eccentric Anomaly, E. The outer figure is a circle with radius equal to the semimajor axis. 'According to Watson , Joseph Legrange showed in 1770 that the solution to Kepler's Equation could be written as a series expansion in Bessel functions, although the modem name and notation was not applied until after the detailed explanations of Friedrich Wilhelm Bessel in 1824. Ruppe  gives several convenient series expansions for anomalies and other orbit parameters. llie elements of an orbit are the parameters needed to fully specify the motion of a satellite. There are several alternative ways in which this can be done. Table 3-1 and Fig. 3-7 show the classical elements or Keplerian elements for an Earth satellite. (Planetary elements are slightly different and are defined in Section. 3.2.) Elements are defined at some reference time or epoch because they are slowly changing with time as described in Section 3.4. The semimajor axis and eccentricity define the size and shape of the orbit. The inclination and right ascension of the ascending node define the orbit plane. The rotation of the orbit within the plane (i.e., the orientation of the line of apsides) is defined by the argument of perigee. Finally, the mean anomaly specifies (via Kepler's and Gauss' equations) the position of the satellite in its orbit at the epoch time.